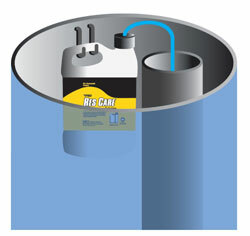 Res Care restores the efficiency of your water softener. Since 99% of water softening occurs within the resin beads, it is important to keep them clean and free of impurities. Salt only washes away the calcium, leaving behind iron, manganese, silt, metal particles and organic compounds. Over time, these contaminants will coat the resin beads causing inefficiencies and in some cases total failure. Res Care is a liquid resin cleaner specially formulated to clear the softener of contaminants that salt alone fails to remove. Using Res Care regularly will restore the softener resin beads and control valve parts back to peak efficiency and help to maintain the life of the unit. For best results, it is recommended to use an Easy Feeder for continued defense against contaminant build-up. Available in 4 ounce, 1 quart, 64 ounce and 1 gallon sizes. 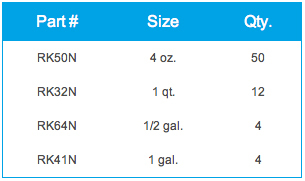 For every one cubic foot, pour 4oz. 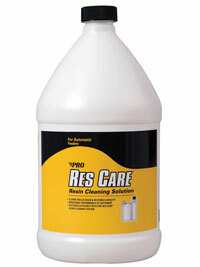 (1/2 cup) of Res Care resin cleaner directly into the brine well. If your softener does not have a brine well, pour Res Care directly into the salt tank when the salt is low. Manually regenerate the softener. If odor, taste, or discoloration is detected in discharge, repeat the regeneration until the odor or taste is gone.